The yew was revered by ancient peoples, who viewed its ability to stay green throughout the winter as magical. The wood of the yew is springy, and has a long history of use as a material for bows. Yew wood is also known for its durability. It has sometimes been called “iron wood,” because fence poles made from yew have outlasted metal ones. Eight different species of yew exist, ranging in height from 1 to 50 feet tall, available in both spreading and upright forms. The first species to be scientifically identified was the European yew (Taxus baccata). All the yews are closely related, and some botanists believe that all species are actually subspecies of the European yew. Three species--the Florida yew, Mexican yew and Pacific yew--are now rare, and listed as either threatened or endangered trees. Despite the fact that its flat, needle-shaped leaves remain a deep green year-round, the yew is not a conifer. The red arils, or berries, produced by the yew are relished by cedar waxwings, thrushes and other birds. Although the fruit is sweet and harmless to birds, the seed inside is highly poisonous to humans and to livestock, notes Botanical.com. All parts of the yew, including leaves and bark, should be kept out of range of pets and curious children, and should be kept fenced off from horses, cattle and other grazing animals. Yews are rugged and shade-tolerant, making them useful landscaping subjects. Their year-round color and sturdiness make the yew an excellent foundation shrub. When used as hedge specimens, they will form a dense green wall. They respond well to trimming, and are a traditional choice for topiary. Yews are slow-growing and long-lived, and are often associated with cemeteries where the trees grow undisturbed. There are many European yews, in Great Britain in particular, whose age has been analyzed to be many hundreds of years old. 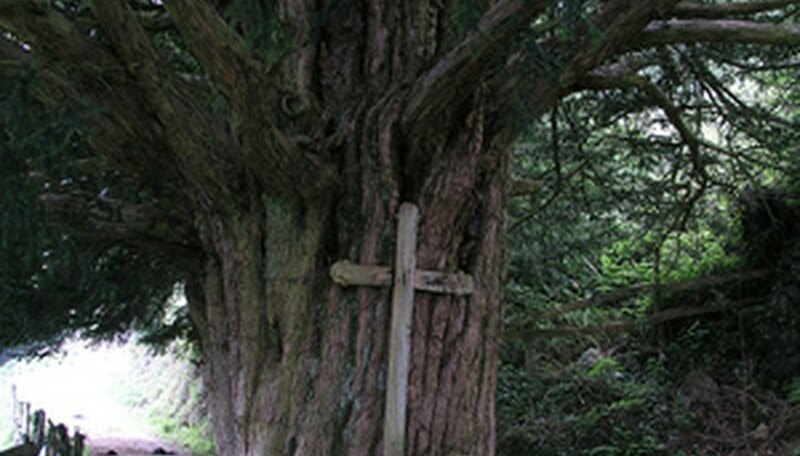 The Ancient Yew Group of England is dedicated to surveying and tracking the health of veteran (over 500 years of age) and ancient (1,000 years old and up) yews across Great Britain. The oldest yew on record is the Fortingall Yew in Perthshire, Scotland, which is estimated to be around 5,000 years old. In 1967, scientists discovered that taxol, a compound found in the yew’s reddish bark, could be used to create a powerful cancer-fighting drug. This led to over-harvesting of the Pacific yew, and the tree became endangered, according to the United States Department of Agriculture. Fortunately, new methods of extraction are now available which use cultivated species of yew, sparing those in old-growth forests.